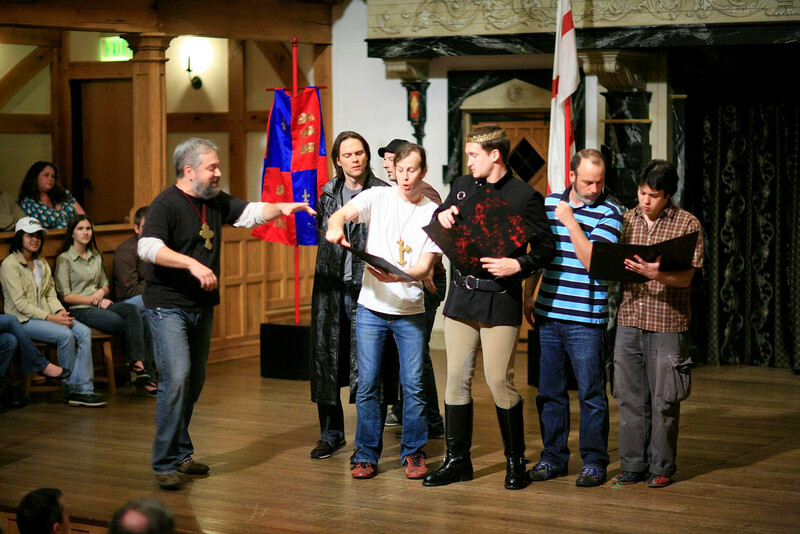 The cast of HENRY V. Photo by TOMMY THOMPSON. 2008. 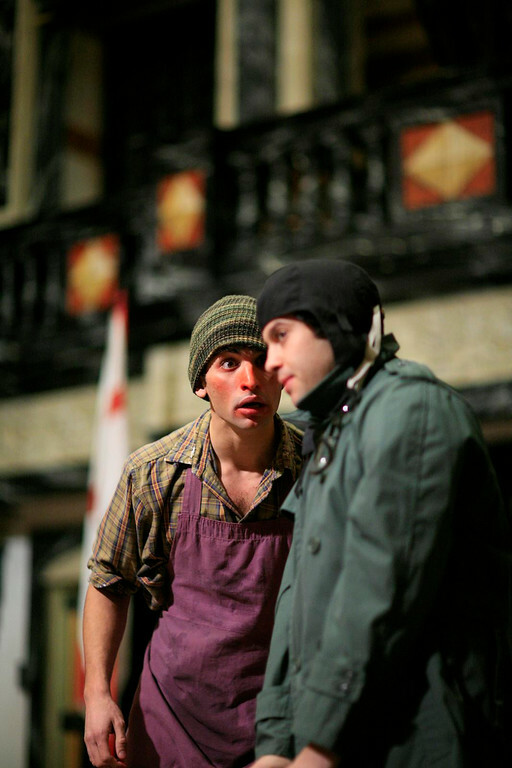 Raffi Barsoumian and Paul Reisman in HENRY V. Photo by TOMMY THOMPSON. 2008. 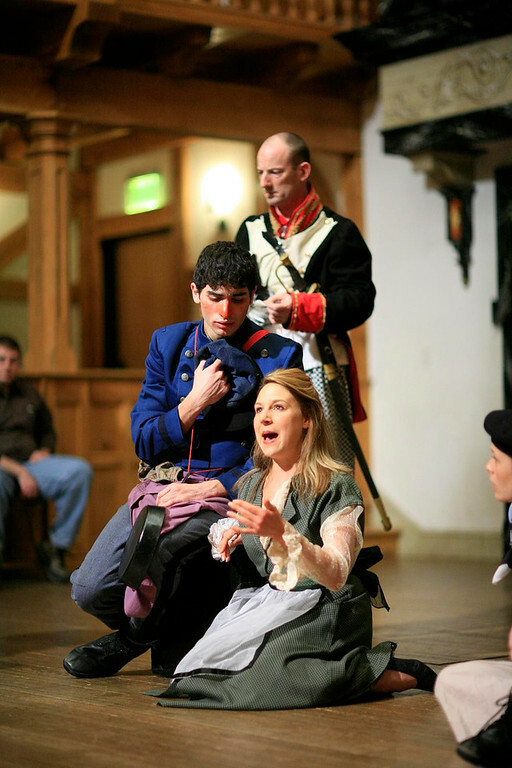 Daniel Kennedy, Raffi Barsoumian, and Ginna Hoben in HENRY V. Photo by TOMMY THOMPSON. 2008. Christopher Seiler in HENRY V. Photo by TOMMY THOMPSON. 2008. 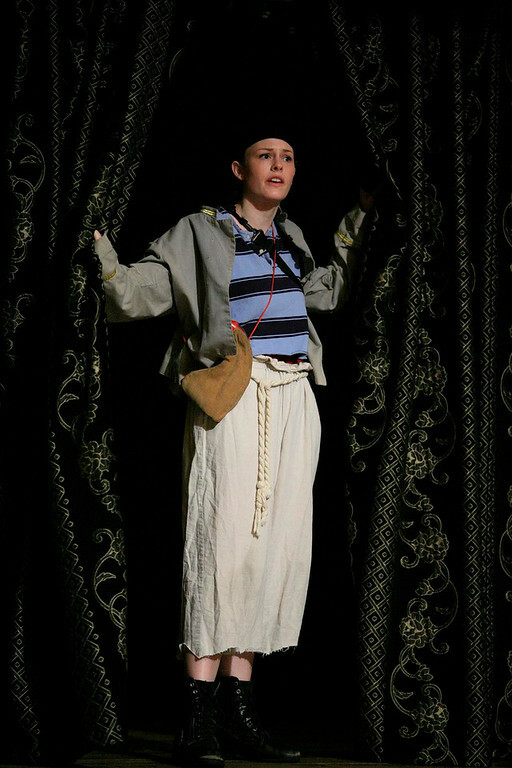 Ginna Hoben in HENRY V. Photo by TOMMY THOMPSON. 2008. 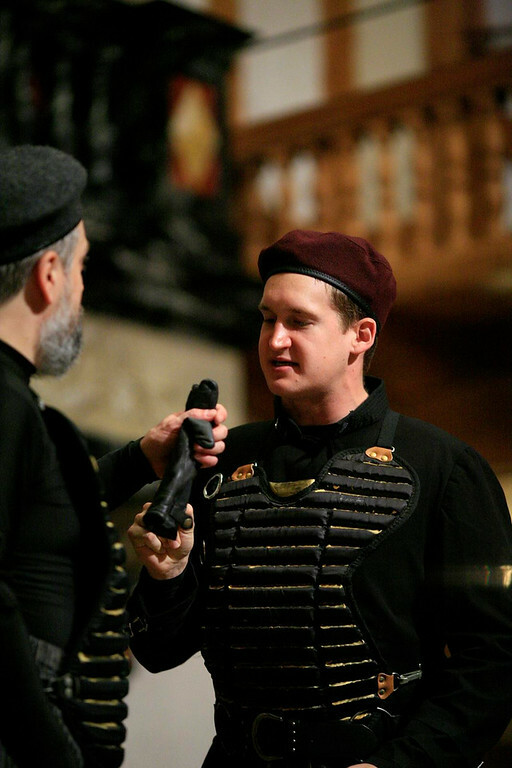 Christopher Seiler and Evan Hoffmann in HENRY V. Photo by TOMMY THOMPSON. 2008. 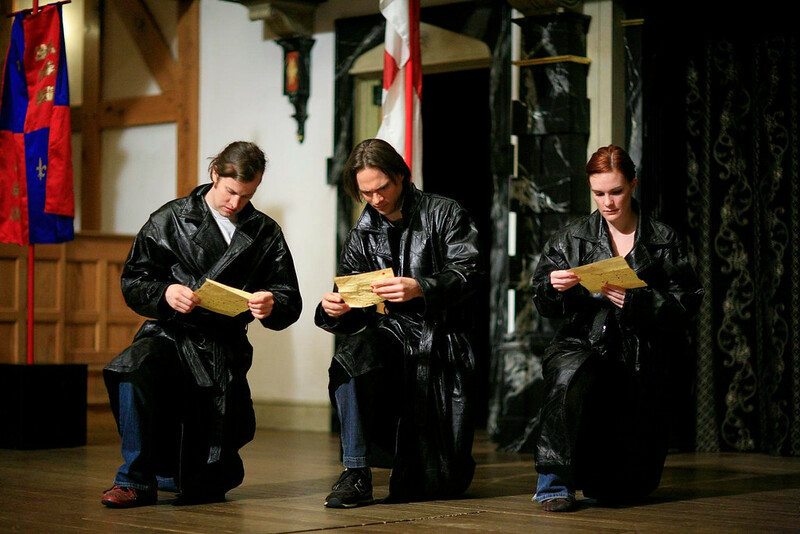 Chris Johnston, Josh Carpenter, and Alisa Ledyard in HENRY V. Photo by TOMMY THOMPSON. 2008. 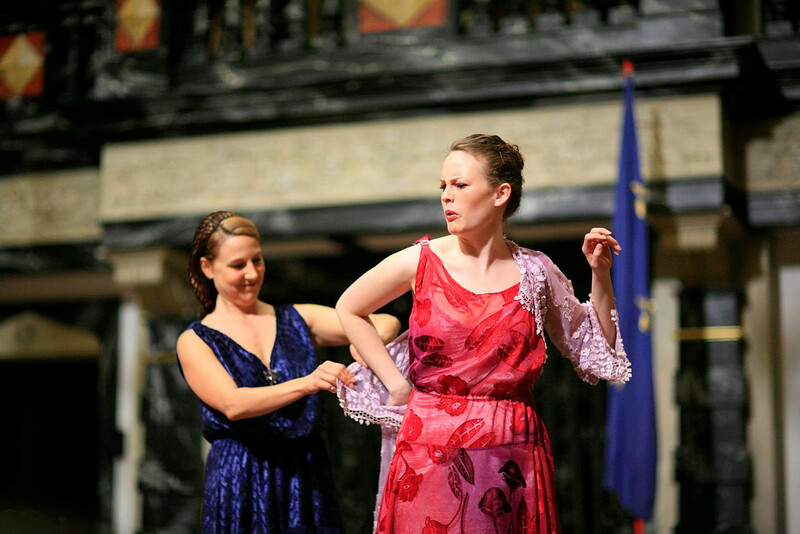 Ginna Hoben and Ellen Adair in HENRY V. Photo by TOMMY THOMPSON. 2008. 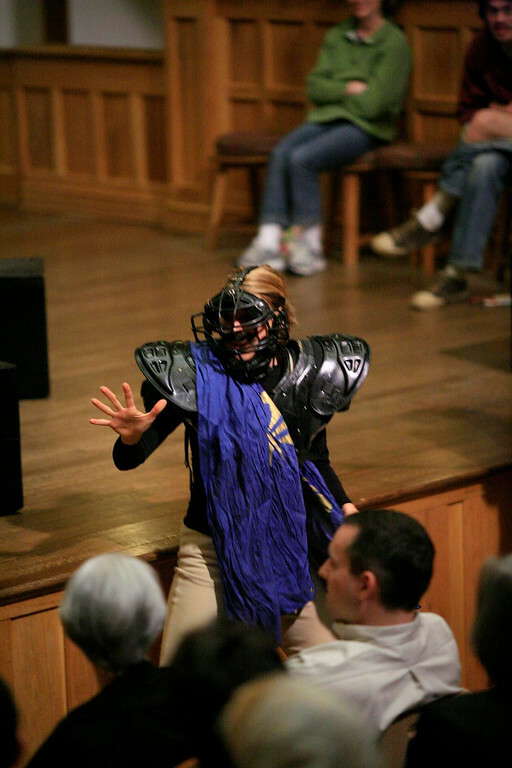 Alisa Ledyard in HENRY V. Photo by TOMMY THOMPSON. 2008. 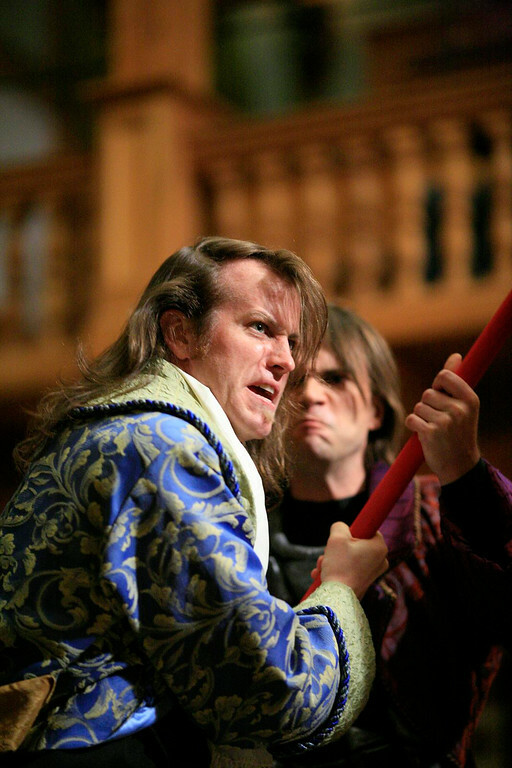 Chris Johnston and Josh Carpenter in HENRY V. Photo by TOMMY THOMPSON. 2008. Prince Hal has led a riotous youth with his tavern companions Falstaff, Pistol, Bardolph, Nym, Boy and Nell. After the death of his father, Prince Hal becomes King Henry V. One of his first acts is to banish Falstaff from his presence, putting his wild past behind him. To prevent a bill that would deprive them of lands and possessions, the Archbishop of Canterbury and the Bishop of Ely have offered King Henry money and the blessing of the Church for an invasion of France. The bishops describe to King Henry the “Salic Law,” one which the bishops interpret as entitling Henry to the French throne. The French Prince (Dauphin) sends King Henry a mocking reply to Henry’s claims to “certain Dukedoms” in France. In London, Falstaff’s friends mourn his death; Pistol, Nym, Bardolph, and Boy depart to join the King’s war on France. In Southampton, King Henry orders the execution of three English noblemen who have accepted French gold to murder him. At the French Court, King Henry’s uncle Exeter demands that the French crown and kingdom be resigned to Henry or bloodshed will follow. King Henry and his army lay siege to and capture the city of Harfleur. At the French Court, Kate, the Princess of France, asks her gentlewoman, Alice, to teach her English. At Agincourt, the night before battle: the French are confident of their superior numbers and yearn for the morning, when they expect sure victory while King Henry disguises himself and walks about his camp to talk with his soldiers. The next morning, the English army engages the French in the Battle of Agincourt. Praising God, wooing, and history ensue. If England to it self, do rest but true. King John stands outside Shakespeare’s great cycle of eight history plays that begins with Richard II and Bolingbroke’s usurpation of his cousin’s throne, and subsequent murder, and ends with the death on the battlefield of Richard III some century later in 1485. These plays weren’t written in chronological order. At the outset of his career Shakespeare had written the end of this story, with the three Henry VI plays and Richard III. then he went back to the beginning, writing Richard II and the two parts of Henry IV, the later two featuring Falstaff and the teenage tearaway Prince Hal, who would become on the death of his father, our Henry V, and the father of Henry VI. 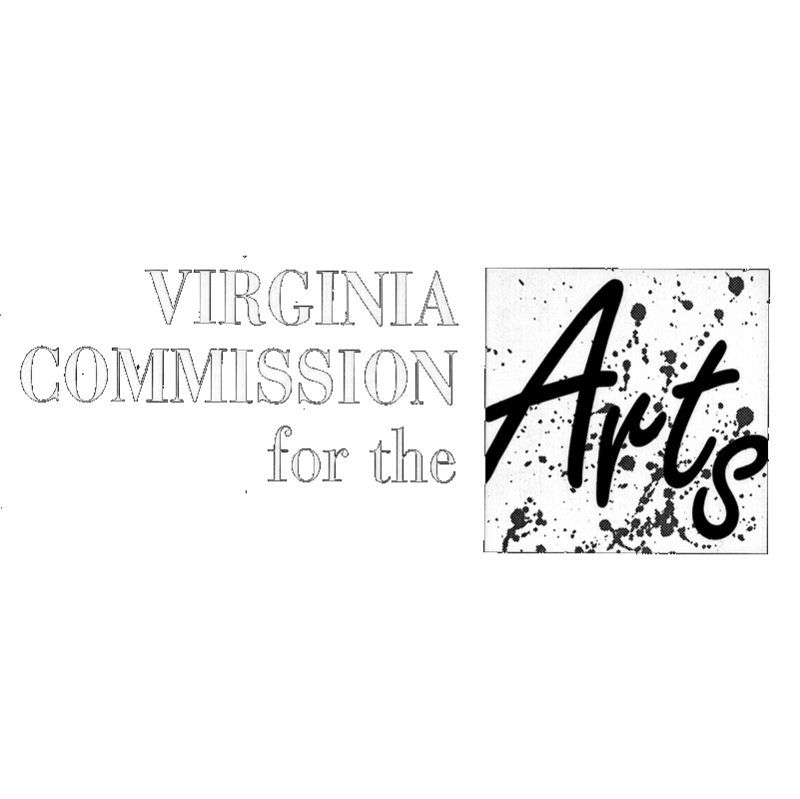 So Henry V, the last play to be written, completes the cycle.  Mostly the plays are packed full of incident: the wheel of Fortune spins wildly; battle follows battle, counterplots follow plot; there is a sense of time passing and characters growing old. Henry V by contrast, is really concerned with a single miraculous day. On 25 October 1415 an English army, heavily outnumbered against the French, close to the village of Agincourt, turned what seemed like inevitable defeat and annihilation into an overwhelming victory. When looking at the whole cycle of these eight plays (beginning with Richard II and ending with Richard III) from and English viewpoint, Henry V is a rare moment of unity and glory. The play strongly suggests what a nation can achieve when it is united under a charismatic leader; yet Shakespeare doesn’t flinch from raising the whole question of the legality of Henry’s war, nor does he avert his eyes from the inevitable horrors that war brings in its wake. The play is probably best remembered for the stunning, stirring eloquence of its famous speeches, both Henry’s and the Chorus’s. I have decided to have the Chorus played by all the company, rather than by a solo performer, and as I write this I’m hoping that will prove to have been a good idea! If you be not too much cloyed with fat meat, our humble author will continue the story, with Sir John in it, and make you merry, with fair Katherine of France: where, for anything I know, Falstaff shall die of a sweat, unless already he be killed with your hard opinion. But by the spring of 1599, when he actually began Henry V, he had somewhat changed his mind. 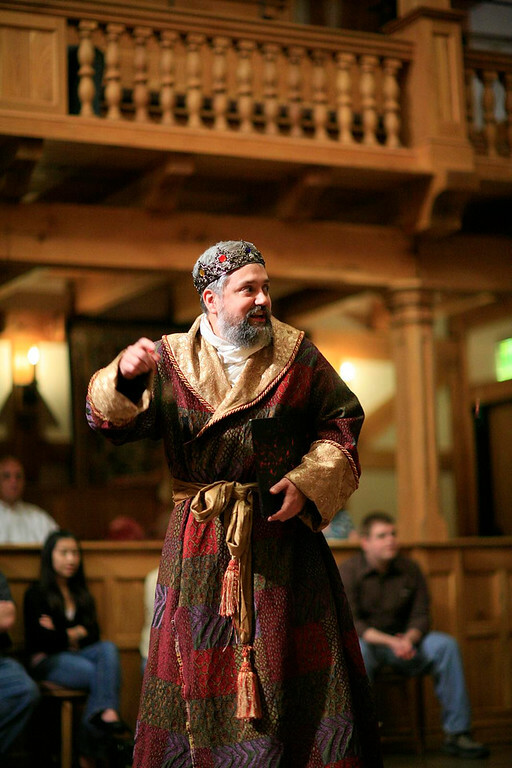 He kills Falstaff off, but he doesn’t let him appear in the play; and most of the other characters from Falstaff’s world that do appear, die before the play is over. Maybe Shakespeare realizes that the popularity of the English history play is on the wane. Shakespeare’s world is changing: old Queen Elizabeth is close to death; the future is uncertain. And in creating the character of Henry, Shakespeare gives us not just a charismatic leader, but a man who admits that he has doubts and fears, just as his own soldiers and subjects do. Henry V clearly inspires Shakespeare to new levels of eloquence and the character of Henry was also a stepping stone in the direction of Brutus and Hamlet, both to be written before the following year was over.